When four young men, slaves on Edward Gorsuch's Maryland farm, escaped to rural Pennsylvania in 1849, the owner swore he'd bring them back. Two years later, Gorsuch lay dead outside the farmhouse in Christiana where he'd tracked them down, as his federal posse retreated pell-mell before the armed might of local blacks--and the impact of the most notorious act of resistance against the federal Fugitive Slave Law was about to be felt across a divided nation. 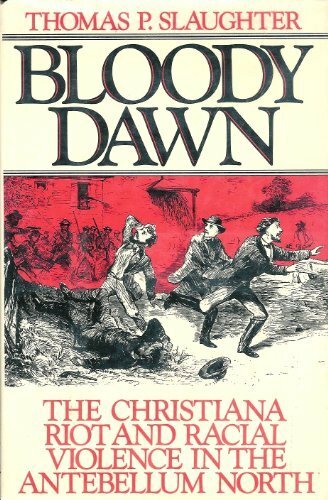 Bloody Dawn vividly tells this dramatic story of escape, manhunt, riot, and the ensuing trial, detailing its importance in heightening the tensions that led to the Civil War. Thomas Slaughter's engaging narrative captures the full complexity of events and personalities: The four men fled after they were detected stealing grain for resale off the farm; Gorsuch, far from a brutal taskmaster, had pledged to release all his slaves when they reached the age of twenty-eight, but he relentlessly pursued the escapees out of a sense of wounded honor; and the African-American community in Lancaster County, Pennsylvania that provided them refuge was already effectively organized for self-defense by a commanding former slave named William Parker. Slaughter paints a rich portrait of the ongoing struggles between local blacks and white kidnapping gangs, the climactic riot as neighbors responded to trumpet calls from the besieged runaway slaves, the escape to Canada of the central figures (aided by Frederick Douglass), and the government's urgent response (including the largest mass indictment for treason in our history)--leading to the trial for his life of a local white bystander accused of leading the rioting blacks. Slaughter not only draws out the great importance given to the riot in both the North and the South, but he uses legal records reaching back over half a century to uncover the thoughts of average people on race, slavery, and violence. The Whiskey Rebellion, Slaughter's previous work of history, received widespread acclaim as "a vivid account" (The New York Times) and "an unusual combination of meticulous scholarship and engaging narrative" (The Philadelphia Inquirer). It was a selection of the History Book Club, and won both the National Historical Society Book Prize and the American Revolution Round Table Award. In Bloody Dawn, he once again weaves together the incisive insights of a professional historian with a gripping account of a dramatic moment in American history. A compelling analysis of racial violence in pre-Civil War America as seen through the prism of the September 1851 riot in Christiana, Lancaster County, Pennsylvania....Slaughter...is a very good storyteller....He neatly weaves together the threads of local, regional, and national crises to offer a persuasive account of the importance of the Christiana Riot in the coming Civil War...An eloquent and insightful story that is respectful of the past, yet speaks to our present concerns with clarity and conviction.